Dividend Exchange Traded Funds listed on the ASX are designed for yield focused investors looking for income in their investment portfolio. ETF are simply investment vehicles invests based on a predefined strategy which in the instance of Dividend ETFs, it invest exclusively in companies which pays a steady stream of dividends. But not all dividend ETFs are same. There are a number of ways of criteria in choosing the best dividend funds for the portfolio. Each product listed below provide a specific segment or factor in dividend stock selection. This range from choosing dividends based on forecast dividend payments (VHY) to dividend heavy Global companies or concentrated exposure in just the largest 20 or 50 companies. We have outlined a list of dividend index funds the investors can use and judge for themselves if the reward is worth the risk. Franking credits is essentially a tax credit for the taxes already paid by the company which is valuable for Australian investors invested in the funds above as the funds will pass through the franking benefit. Investors can use our Franking Credit Calculator to find what is the real yield on the investment with the inclusion of the credits. We have not included any property trusts or REIT ETF because the primary focus is finding the best dividend fund across the market where REIT ETF is a income focused product that invest only in property trusts. Important to note that one risk of investing in these funds is that investors can over emphasis the immediate income, or focus on the high yield at the cost of long term returns. Research shows that income growth forms an important part of long term investment returns. In most instances income growth sustains dividend growth. Are the current payout amount sustainable? Are the management sacrificing the long term value to satisfy the immediate demand of investors? What are the key drivers of growth for the business that it lead to higher dividend down the track? What the balance sheet look like after paying out all the earnings? It pays to have a forward looking bias in evaluating investments. Vanguard Australian Shares High Yield ETF (VHY) is a typical vanguard product with no frills and a low annual expenses for the investor. The goal of VHY is to focus on companies that provides higher yield than the underlying index (FTSE ASFA Australian High Dividend Yield Index). The fund certainly live up to the vanguard reputation in which the management fee is only 0.20% a year. There are some strict restrictions on concentration where no more than 40% of the fund is invested in a single sector and largest position being no more than 10% of total fund assets. Currently the fund has 40% of assets in the financials which is significantly higher than the broader ASX 200 index fund (ASX XJO). Since inception in 2000 VHY has averaged 12% per annum evenly distributed between yield and capital growth. VHY can be considered attractive for those that are looking for long term equity market returns with a slight focus on immediate income. SPDR MSCI Australia Select High Dividend Yield ETF (SYI) is the State Street version of the Australia dividend ETF product. It follows the MSCI Australia Select High Yield ETF. Management fee is set a 0.35%. One commonality between these funds is the heavy weight to the financial sector. 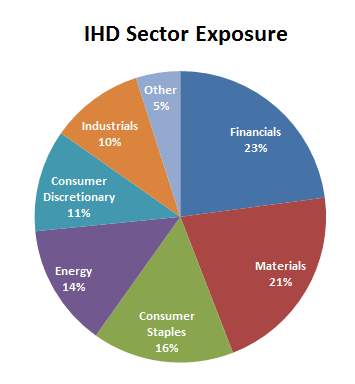 iShares S&P/ASX Dividend Opportunities (IHD) aim to differentiate it self by focuses on a broader index and sector diversification. While financials like banks account for 20% of the fund, the overall fund is broadly diversified. BetaShares Top 20 Equity Yield Maximiser (YMAX) invest in the ASX 20 index (a more concentrated version of ASX 200) with a twist. It writes call options with the aim of generating additional income from the premium. The goal of the fund is to generate an income stream that is higher than a straightforward investing in the 20 companies in ASX 20. These kind of strategy implemented by YMAX ASX will lead to out performance where the market is trending down or flat. However there is always a cost of doing business, if the market has a run up then some upside will be sacrificed. In overall context of the global equity markets, the Australian equity market only account for 4% of global market value. Investors often has a home investment bias which is in the simplest sense is overweighting allocation to the home market and underweight global equities. SPDR S&P Global Dividend ETF (WDIV) provides a counter weight to the home bias of investors by tracking the S&P Global Dividend index which includes 100 companies listed around the globe that pays a generous dividend yield. Distributions are paid quarterly. ASX WDIV provides some form of international exposure for investors with a dividend angle. 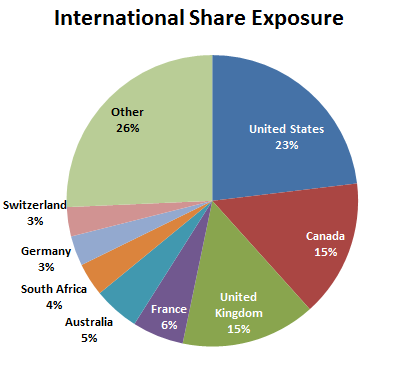 The pie chart below highlight the individual country exposure of the shares in the fund. 24 countries are represented and the top 10 countries make up 75% of the fund. US (primary index S&P 500), Canada and UK shares make up more than 50% of the fund. WDIV is designed for Australian investors that are already overweight Australian shares where only 5% of the fund invested is in Australian shares, WDIV provides international diversification with a yield focus. One issue with international dividend exchange traded funds is that the yield will be typically lower than Australia focused dividend ETF’s. This is because dividends made by Australian companies includes franking credits. This means that there is no double taxation of dividends for Australian investors while foreign companies are taxed in their local market. This case does not apply for foreign equities which means that the dividends paid by these companies are already taxed but they do not come with franking credits. Australian investors would have to pay tax again on the same income. This is the primary reason that most US companies in most instances lean towards share buybacks as the preferred form of returning capital to shareholders in the share buyback vs dividend debate. The upside to this is that companies usually uses a balance of dividend and buyback which means that there will be capital appreciation in the return mix.